MICHELIN Road 5 #1 for wet grip on the road. Using the latest combined technologies of MICHELIN 2CT and 2CT+ and the latest generation of compounds and siped tread, MICHELIN Road 5 tyres offer you the best wet grip versus its main competitors2 without compromise on dry roads. Even when 50% worn, experience exceptional braking in the wet1 Even when 50% worn, a MICHELIN Road 5 tyre stops as quickly as a brand new MICHELIN Pilot Road 4 tyre thanks to the evolutionary MICHELIN XST Evo sipes. 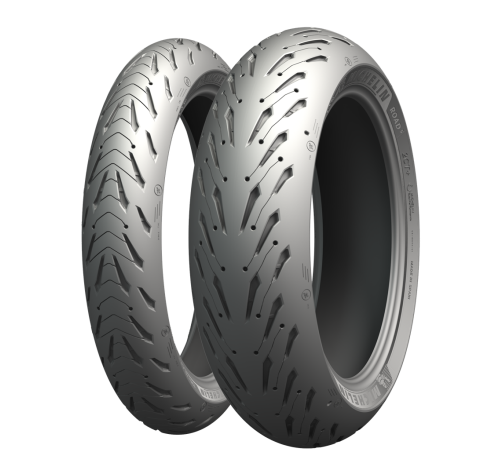 Fun to ride With its improved dry grip and stability and the best handling versus its main competitors, thanks to MICHELIN?s patented ACT+ casing technology, it offers even more riding pleasure. Michelin always aims to bring together multiple performances. At MICHELIN, we never work on one isolated element of performance. Instead, we focus on the whole package: safety, durability and the thrill of riding? all at the same time and with no trade-offs. That?s what we mean by MICHELIN? Total Performance?, which has and will always be our difference on every tyre. There are no Reviews for the MICHELIN ROAD 5 TRAIL yet. Why not be the first to write one?